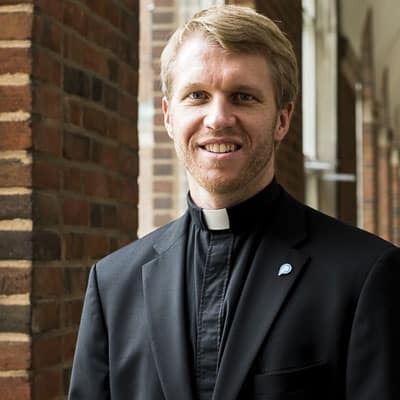 Paulist seminarian Mike Cruickshank hails from Chelmsford, MA. He earned a bachelor's degree in computer science from Washington University in St. Louis, MO. Mike worked as a financial advisor in New York City after college. He met the Paulist Fathers at our mother church, the Church of St. Paul the Apostle in NYC, where he was active in Apostolist, the parish's vibrant young adult ministry. Mike entered our novitiate on August 24, 2013. He made his first promises to the Paulist community on July 26, 2014. "Although I was raised Catholic, I fell away from the Church during my college and young professional years. Then I moved into the Lincoln Center neighborhood of New York City and started attending St. Paul the Apostle nearby, which just happened to be the Paulists mother church! The energetic atmosphere and welcoming spirit there were noticeably different from my other church experiences. I became involved with the young adult ministry there and felt such a joy that I was not getting in my finance job. Finally, about a year and-a-half before entering the novitiate, I felt a call to strongly consider the priesthood. After a year off spent reflecting, discerning and traveling, I decided to enter the Paulist formation program." What he enjoys most about being a theology student: "The classes have been really interesting. My educational experience has been more technical in nature, so the philosophy/theology classes are something new and really force me to think about things in a different way. But one of the great benefits of community life is the opportunity to discuss these topics with my fellow Paulists, who can certainly relate to being in my shoes." In January, 2015, Mike spoke about his vocation while giving the Annual Paulist Appeal at our mother church, the Church of St. Paul the Apostle, in New York City.